Deontay Wilder beat Bermane Stiverne inside the first round on SaturdayWBC heavyweight champion Deontay Wilder says he will beat Anthony Joshua in his "safe haven" of Great Britain.Wilder, 32, defended his belt against Bermane Stiverne on Saturday, a week after Joshua retained the WBA and IBF crowns against Carlos Takam in Cardiff. "Packing out stadiums looks good but the money and Mecca of boxing is in America," Wilder told BBC Sport. "But if you want to stay at home like a little girl, this king has no problem travelling to knock out the champion. "In an interview with BBC Radio 5 live, Wilder accused promoter Eddie Hearn of "brainwashing" British fans with "rumours" that Joshua is the best heavyweight in the world. "I think Eddie is ducking me more so than Joshua," Wilder added. "If Joshua's a strong champion, a true champion, you guys in England should smoke him out, make him fight. You should see if he's the best. "My heart says I'm the best, if I'm not I want someone to show me." 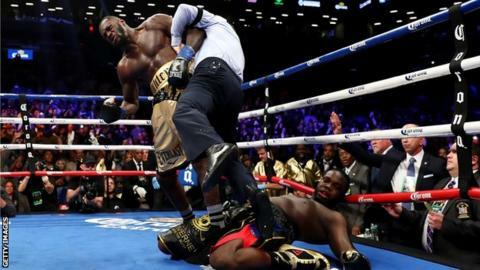 In 2015, Stiverne became the only man to take Wilder 12 rounds, but succumbed within just one at New York's Barclays Center on Saturday. The win took Wilder's unbeaten record to 38 knockouts from 39 bouts in a professional career which began after he claimed a bronze medal at the 2008 Olympic Games.Hearn argues that Wilder's relatively insignificant profile in Britain would require him to be realistic in any negotiations for a Joshua fight and has called on him to first face Dillian Whyte in London in February.Wilder, who says he will compete for 10 more years in order to achieve his "mission" of unifying the heavyweight division, called Whyte a "B-level fighter".He added: "He's Eddie Hearn's dirty rag in his pocket or his spare tyre on his car. He's a gatekeeper at best. If Dillian is the bridge to Joshua, make sure Joshua is at the end of that bridge. "All Eddie has to do is put AJ on that contract. I will only fight a peasant if the king is behind him." Wilder conceded that he likes "what Joshua stands for" and believes a bout with the unbeaten Briton would be the biggest fight in boxing history.Any bout would unify the WBC, WBA and IBF titles, with the only other major honour in the division belonging to WBO champion Joseph Parker. No fighter has ever held all four since the WBO was founded in 1988.Wilder also hopes Tyson Fury can add a further dimension to the division if his boxing licence is reinstated. Following his 2015 win over Wladimir Klitschko, Fury held three of the belts - missing only the WBC title - but relinquished them all in the months after his triumph. "I love him as a person and a fighter," said Wilder. "A guy like that, charismatic, entertaining, you must respect because he's different. People don't want to understand different. "If it wasn't for Tyson Fury, England wouldn't be on the map like it is. I feel he should be more respected in that country than he is. "They should give him his licence back. He is still a human being and should be allowed to get on with his life. He is still the champion in a lot of people's eyes, he has not been beaten yet." BBC Sport boxing correspondent Mike CostelloEddie Hearn, Joshua's promoter, was saying they have exchanged tweets in which Joshua said "I'll eat him". That was in reference to Wilder's weight of 15st 9lbs. That's almost identical to what Muhammad Ali weighed against Joe Frazier all those years ago. So you have someone representing heavyweights from the past and then Joshua, someone representing the modern-day super heavyweights. I think it adds another dimension if and when it happens.BBC 5 live boxing analyst Steve BunceI think Joshua had gone past the optimum weight when he fought Carlos Takam in Cardiff. Wilder has had 19 more fights than Joshua. All right, he might not have broken a sweat in some of them but he had to train for them, spar for them and that you can't replace, especially at heavyweight.